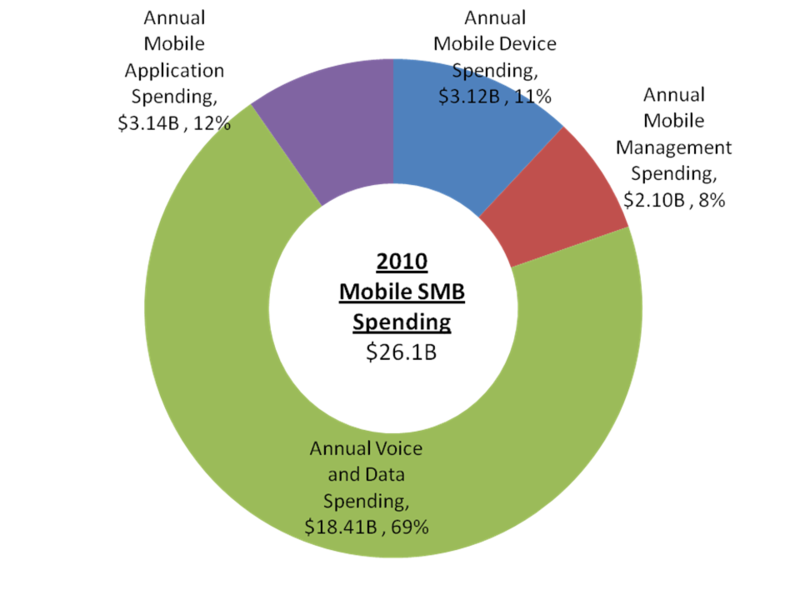 we performed a detailed analysis of U.S. small and medium business (SMB) spending on mobile devices, applications, and services. As explained in this study, SMBs (1-999 employees) spent approximately $26.1B on mobile solutions and services in 2010—an amount forecast to increase annual at a rate of 17 percent for the next few years, with some segments growing much faster than the others. As indicated on Figure 1, voice and data services gobble up the biggest part of SMBs’ mobile budgets (69%), followed by mobile application (12%) spending, mobile devices (11%), and mobile device/application management (8%). In the U.S., mobile service providers typically subsidize mobile device costs as part of their two-year mobile service contract subscriptions, resulting in the lower spending for mobile devices–which would cost two to three times more if they weren’t subsidized. While SMBs currently spend more on devices than on mobile management, growth in spending for the latter is outpacing spending on the former by roughly 13%. This reflects the reality that as mobile adoption and business dependence on mobile solutions grows, SMBs will need to invest in solutions to more efficiently manage mobile services and solutions. Although SMBs currently spend more on voice and data services than mobile applications, survey results indicate that spending for mobile applications grow about 30% faster than for voice and data services. Very small businesses with 1-19 employees spend about $150 per year per employee on mobile devices, compared to $101 per employee for companies with 50-99 employees. Expenditures for annual mobile voice and data service plans per employee rage from $1,056 for companies with 1-19 employees to $511 for small businesses with 50-99 employees. Annual mobile application spending ranges from $416 per employee for companies with 1-19 employees to $292 per employee for companies with 50-99 employees. The role of the user-management, sales, office manager, information worker, etc.–and the industry are key factors in determining what types of devices are selected. For example, Information workers in industries like health care, legal, real estate are adopting smartphones and tablets more rapidly than other types of users in other industries. Mobile device companies that develop new devices that tailored to specific user roles and industries. Mobile web and mobile application providers to create innovative new applications that help SMBs perform business functions more easily and flexibly. Service providers that go beyond voice and data service plans to offer higher value solution bundles. However, the high cost of mobile service plans threatens to stall SMB adoption of smartphones and other devices that enable employees to take advantage of mobile business solutions. This is particularly true in very small businesses (1-19 employees), where 40% cite high voice and data costs as a top barrier to mobile solution adoption. Even when we look at the total small business group (1-99 employees), 37% say these costs are their top obstacle. As a result, 43% of small businesses currently provide voice-text only phones and plans to employees. Of late, service providers are offering more limited choices for voice-text only phones, which will push some small businesses to invest in data service plans, smartphones and the applications they enable. But, small businesses will need more flexible and affordable data plans to take advantage of the mobile applications that can help their businesses grow. We’ll be watching closely to see what types and which vendors will try to shake up the status quo with new pricing schemes, bundles and incentives to help small businesses take better advantage of the mobile opportunity. For more information and a Table of Contents is available for this study click here: 2010 Small and Medium Business Mobile Solutions Study.